hot, bitter and salty. Be adventurous and try individual dishes or do what the thais do and put everything on the table at once and share. 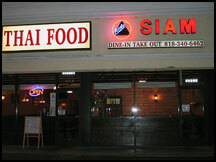 A popular misconception about Thai food is that "spicy" foods are equivalent to "hot". Unlike other oriental cooking styles, thai cooking makes greater use of asian spices and relies less on hot peppers to flavor foods. Thai cooking is healthful cooking. We use only the freshest, highest-quality authenic ingredientes. If you have any special dietary preferences or needs. Please let us know. No Monosodium Glutamate Preservatives (MSG), extra oil, sweeteners, or other taste enhancers are added.